The second edition of the Swiss vintage cycling festival BERGKÖNIG Gstaad is already a real hit. Two months before the event, many former Swiss cycling superstars confirmed their participation, such as Urs Freuler, Albert Zweifel, Gilbert Glaus or Mauro Gianetti. Vintage cycling means cycling like in the good old days. Events for steel-framed bikes and wool jerseys have been popping up all over the world in recent years. The BERKGÖNIG Gstaad is already catapulting into the first division with its second edition: on 25 and 26 August it will shine with many former cycling superstars and up to 500 expected participants. The list of participants of the BERGKÖNIG 2018 reads like a Panini album of the past. The names that are found here include Albert Zweifel, who has 5 World Championship titles and is one of the most successful cyclocross racers of all time; Urs Freuler, 10-time world champion, winner of the Giro and two-time Swiss Sportsman of the Year; Gilbert Glaus, unforgotten and so far the only Swiss winner of the final stage of the Tour de France on the Champs-Elysées (1983); Mauro Gianetti, one of the most important Ticino cyclists, vice-world champion 1996 in Lugano and one of only five Swiss winners of the “Cycling Monument” Liège-Bastogne-Liège; Thomas Wegmüller, unforgettable “plastic bag” second at Paris-Roubaix 1988; track superstar Franco Marvulli, triple world champion and 16-time Swiss champion; Hanskurt Brand, European Stayers champion from Gstaad; André Massard and Patrick Moerlen, two members of the legendary international Swiss team Cilo-Aufina; or Walter Bäni, former Swiss champion and track record holder. 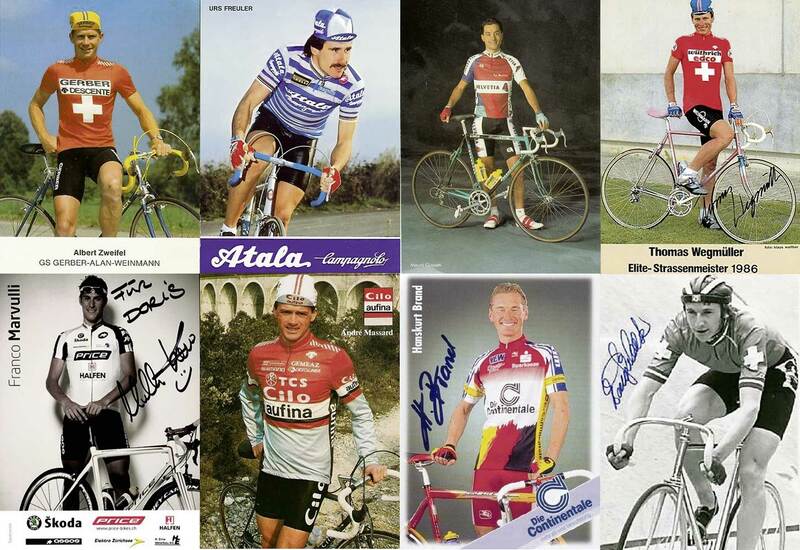 However, the BERGKÖNIG is not only open to ex-superstars, but also to everyone with a racing bike from before 1990 and suitable clothing, namely a wool jersey, black pants, leather shoes and a matching cap. The BERGKÖNIG Gstaad offers various routes from 20 to 105 km on small, mostly traffic-free mountain roads with beautiful panoramas. The food included in the starting price consists of handmade products such as sausage and cheese from the region. On Saturday evening the first highlight will take place, a sprint from the Gstaad pedestrian zone to the slightly elevated, world-famous Gstaad Palace Hotel, where all participants will be served a tasty aperitif as part of the official welcoming ceremony.